M.C. 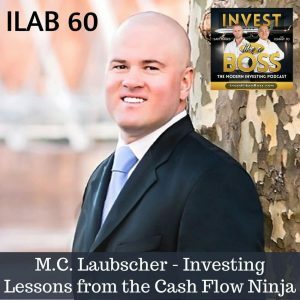 Laubscher is the CEO of Valhalla Wealth Financial, a company that helps individuals, families, small business owners, professionals & entrepreneurs employ wealth acquisition & financial management strategies for growth. M.C. is also the host of the popular business and investing podcast, Cashflow Ninja. He challenges existing societal belief systems and misinformation on money, saving, investing, wealth, and retirement. During the show, M.C. will reveal the six pillars he learned after interviewing over 150 successful investors. He will speak on accumulation and the cash flow model including the power of masterminds and mentorship. Listen to the end for the three principles to help build your wealth, happiness, and success. Listen to ILAB 60 on iTunes here or subscribe on your favorite podcast app.